…and now for the third post of the day, Halloween. This was the first time since we moved into our home 8 years ago that we didn’t sit out on the driveway handing out candy to all the local children. A wonderful friend of ours, Sunny and her husband JW, invited us to go to their house and join them and their 2 young children trick or treating. We jumped on the chance. Here at home we typically have 250 or so trick or treaters. That is no joke as I ran a tally one year just to check. Anyway this normally meant about 35lbs of candy and the expense was horrific not to mention the temptation. Sunny and JW live on a very quiet back road so to speak where they haven’t had any trick or treaters in 15 years. Sunny had put up a notice on the mailboxes letting the neighbours know that she would be round with a couple of preschoolers and if they wanted to participate they should leave their porch light on. About 6 homes participated. We went out soon after 5 and were home just as it got dark. The children had enough candy/chocolate but not too much and then they had the rest of the evening to calm down. If we’d have been at home Kirsten would have received excessive amounts of candy and chocolate and would have ended up crashing from the sheer excitement of the goings on in our neighbourhood. In the run up to Halloween we also had numerous parties. This year I decided to spend a little more on Kirsten’s costume and bought it through Etsy.com. This is an amazing site if you haven’t used it where you can buy thousands of different one of a kind items. 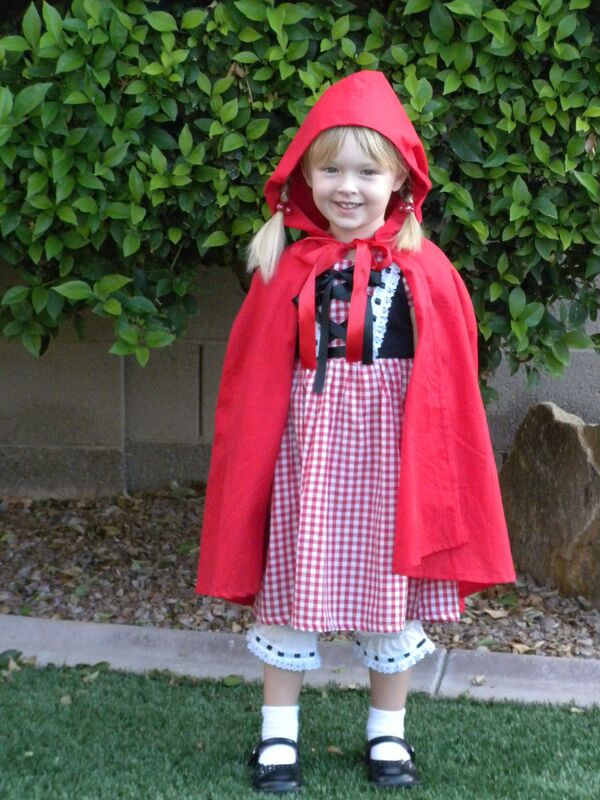 I custom ordered Kirsten’s costume of Little Red Riding Hood back in August and it took about 3 weeks to receive. The store was: http://www.bellajeanboutique.com/ The quality of Kirsten’s costume was wonderful and was 3 pieces: A dress; bloomers; and a wonderful cape. Kirsten has now worn the set 4 times: preschool; gym twice (once for parents’ night out and secondly for their party) and then of course the night itself. 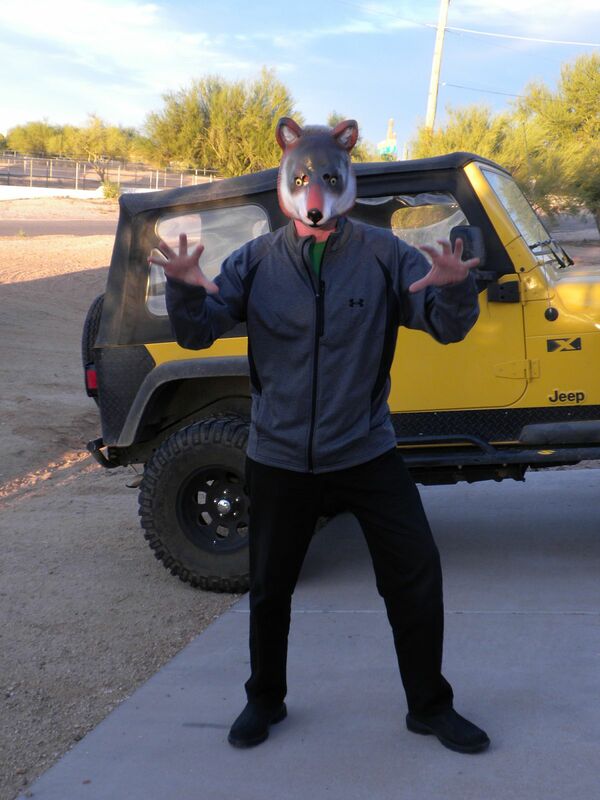 For trick or treating I had bought John a wolf mask so he could be the Big Bad Wolf. 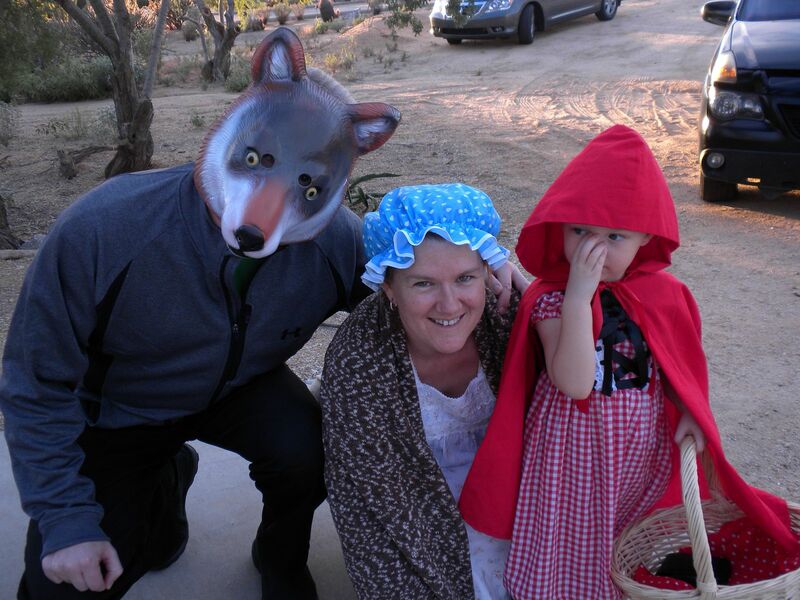 Unfortunately Kirsten was petrified of the mask so it spent most of the night on the back of Daddy’s head. I, of course, was Grandma, although I didn’t wear glasses because with the sun setting I couldn’t see a thing. I know, I know…two posts in one day but I have a lot of catching up to do as I want to make sure when I go away in 4 weeks’ time everything is completely up-to-date so that when I get back I only have to post about what we have done during the trip. 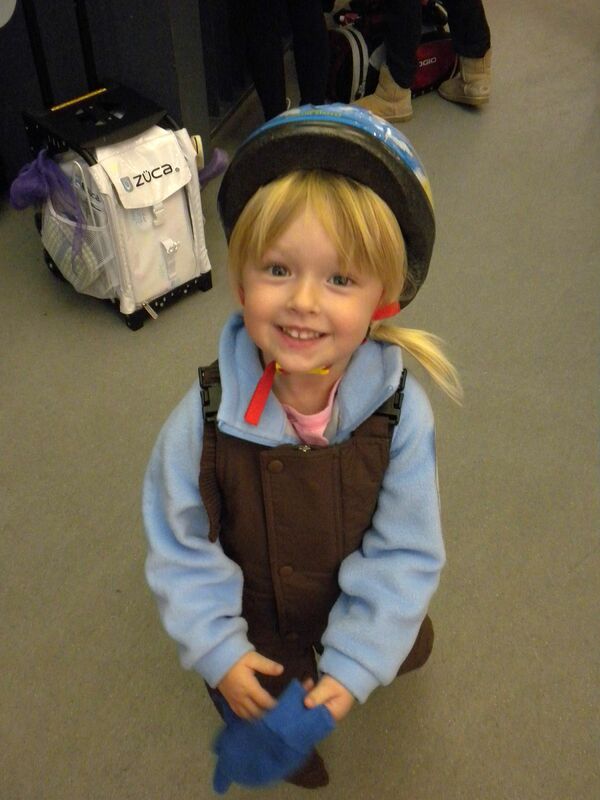 Kirsten was given a pair of ice skates by her Norwegian Great Grandmother last Christmas. To me she is known as Mormor (Norwegian for Mother’s Mother) and to Kirsten she will be referred to as Oldemor (Great-Grandmother). Some of you will know and others won’t that when John and I moved to Arizona back in 2002 I decided to take up the sport of Figure Skating but stopped when I discovered that I was pregnant and hadn’t been back since. 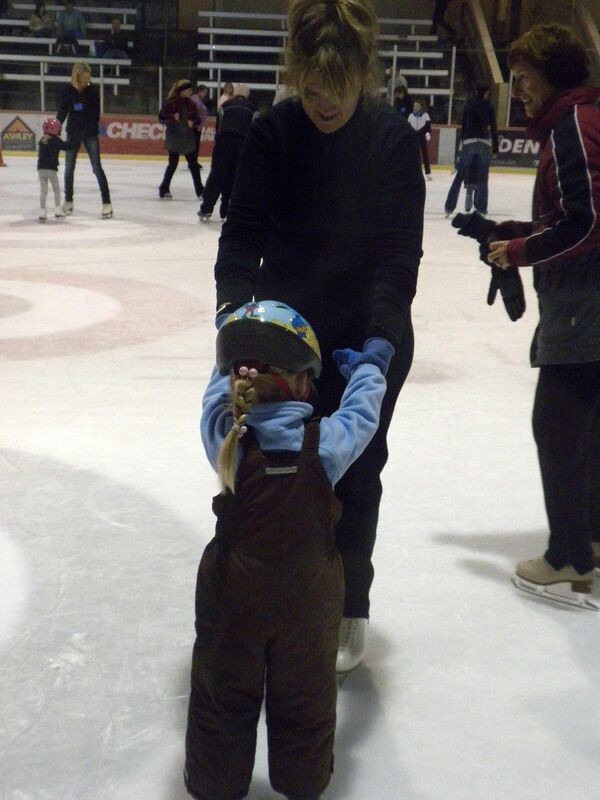 Kirsten had started to mention that she wanted to go iceskating and not because I had made the suggestion to her but because she had a number of bedtime stories that mentioned skating and a number of the programmes she watches on tv also mention it occasionally. The other Thursday, 21 October, Kirsten had an early release day at school and it was also Parents n Pups at the icerink. 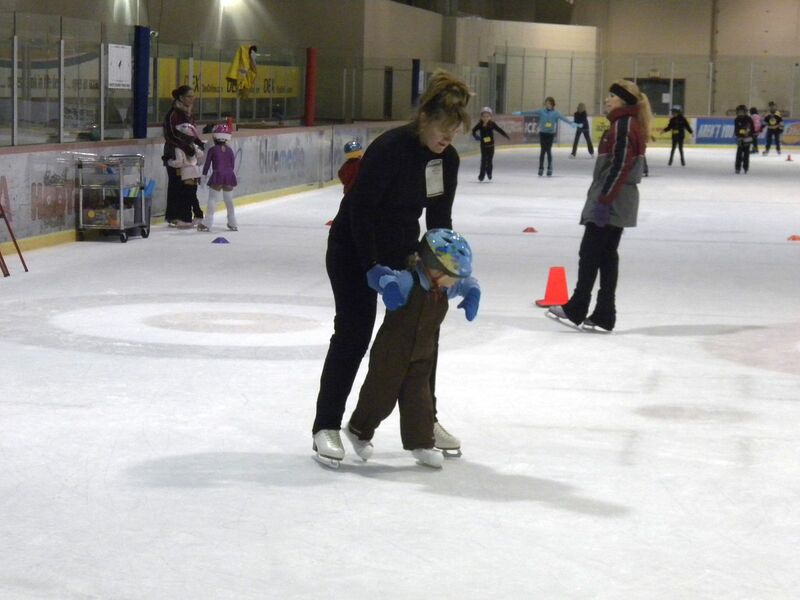 This meant that during the Learn to Skate session for children part of the ice is set aside for parents to take their toddlers (2.5 – 5 years old) on the ice for a group lesson too which I thought would be perfect. 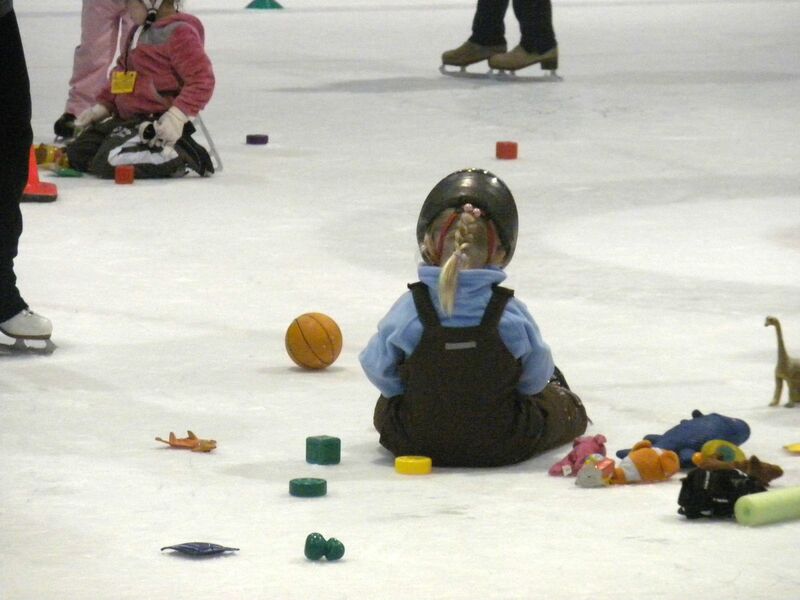 I had already confirmed with the ice rink that it wasn’t sold out in advance ie people signed up for the complete 6 weeks, so that Kirsten and I could do a drop-in class (just turn up). On the Monday after swimming (which is right by the rink) we had popped into the rink and had both pairs of skates sharpened. On Thursday after school Kirsten was forced down for a nap as I knew it would be a late night. The class runs from 5.45 – 6.30pm and Kirsten is normally going up for a bath between 6.30-7pm so there was no way that would happen. 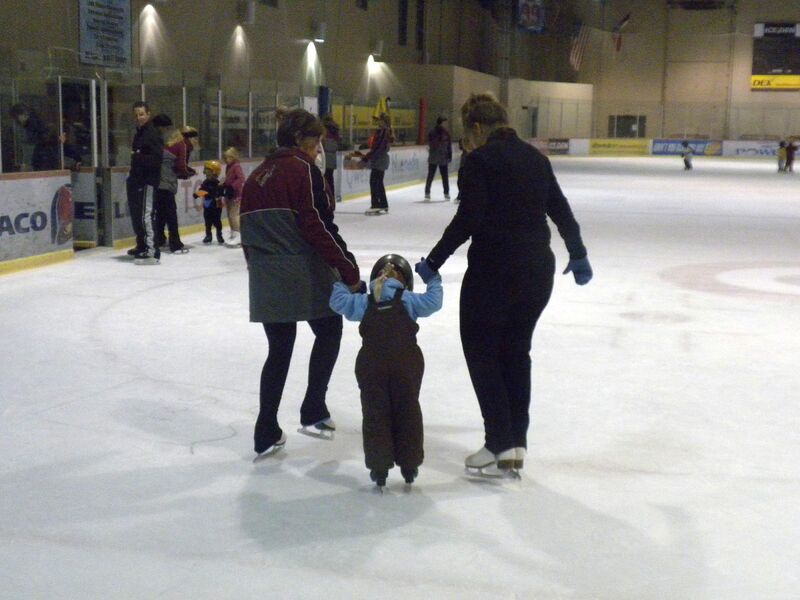 The staff at the ice rink welcomed me back with open arms and it was as if I hadn’t been away for the last 4 years. I’m hoping to take Kirsten again tomorrow. If she shows as much enjoyment then I suspect that we will stop swim classes and start iceskating class in the New Year instead. I look forward to that too as it is something I can do with Kirsten, but ultimately it is Kirsten’s choice. John also left work early so that he would be able to be there too. Kirsten was wrapped up wonderfully warm as we used some of the clothes that I have purchased for our trip back to England over Christmas. In actual fact she was so warm and toasty she just didn’t want to get off the ice at the end. I’d layered her up with tights, leggings and snow trousers on the bottom half and on the top she had a cotton long sleeved t-shirt, fleece jacket and the snow trousers as they were actually dungarees and you can see she had her cycling helmet on her head and also mittens. The mittens were the only item of clothing we had a problem with as they kept coming off. Probably because she was holding onto me so tightly. Sticking to habit I’m now running a month overdue for this post as we were on vacation in Dana Point from September 25 – October 3rd. Yup we’ve been back a month. We had a wonderful trip even though the area had their hottest temperatures on record so we had little respite from Arizona heat. It was a wonderful busy week and even though when we all drove over we had colds and John had the tail end of tonsillitus by about midway through the week we were all fit and healthy. We drove across on Saturday and stopped off at the Premier Outlets just outside Palm Springs. 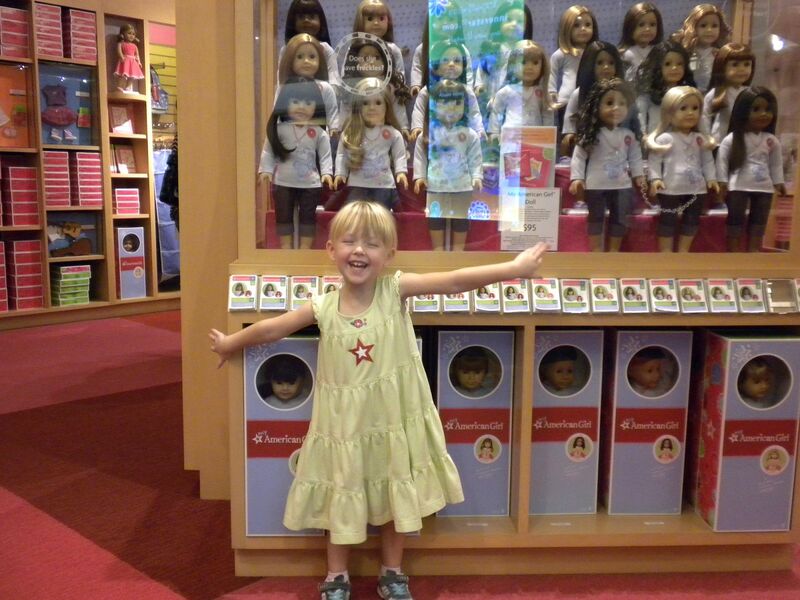 On the Sunday we drove to Beverly Hills so that we could go to The Grove Shopping area in order that Kirsten could visit the American Girl store. We ended up in the store at both the start and the finish as Kirsten was so over excited that the first time in the store all she wanted to do was go up the escalators, run through the store and down the other side and then out again. 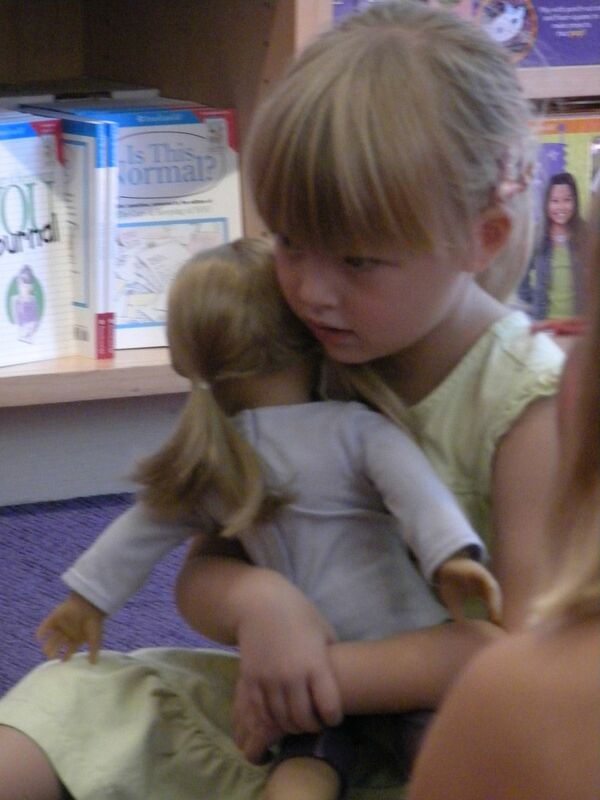 When we finished going round the shopping district we offered Kirsten the opportunity to go back to the store and this time she had a lot more fun and came out with a doll of her own. The rest of the week included a trip to Legoland. Some of you will remember we went there last year. This time was more for Kirsten to take a quick look at everything again and enjoy some of the rides. She also got her first bee sting so we had the park medics check her out. Once she’d been given a giant plaster (band aid) she was happy again. Next up was a trip to Disneyland. 8 hours round the park and there was still plenty to see and do even with a toddler. Kirsten loved it and by the end of the day was so exhausted that she fell asleep in the car and then on the floor right inside the front door of the condo. 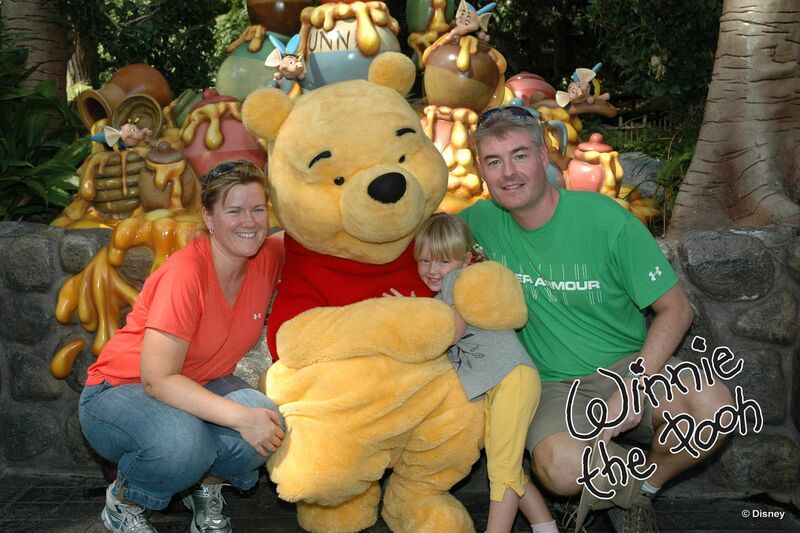 We all got to meet Winnie the Pooh, Tigger and many more. 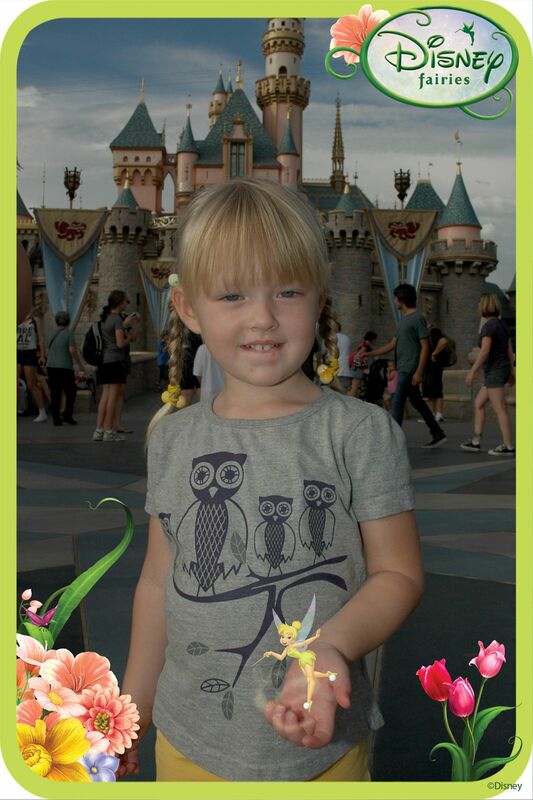 We bought ourselves a 2 day park hopper ticket so we went back 2 days later and spent the morning in California Adventure and then the afternoon in Disneyland again so that Kirsten could go to the Princess Parade and she met Jasmine (Aladdin), Snow White and Cinderella too. 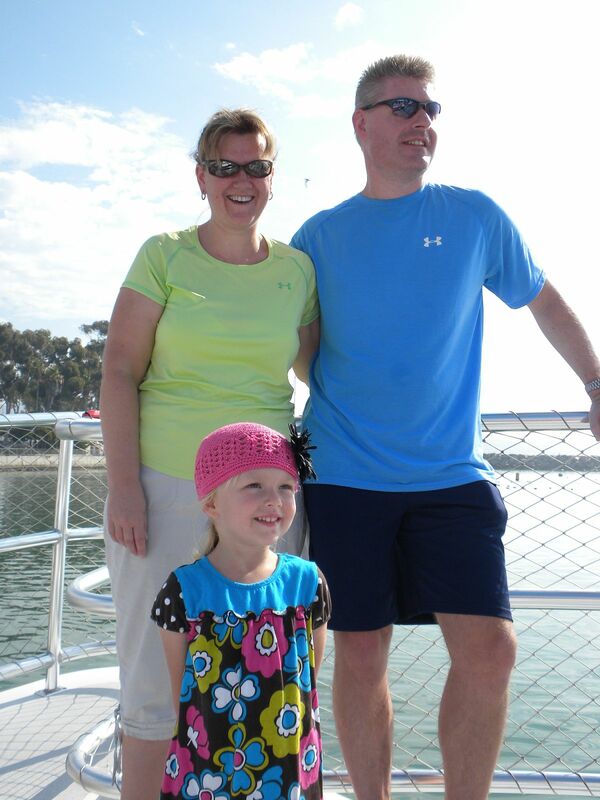 We finished out the week with a cruise from the local wharf to see the dolphins. It was beautiful and I would recommend it to anyone and everyone. It involved going out on a large catamaran for 2 hours and within minutes of leaving the harbour we came across some dolphins. It was amazing and as there were only 10 of us on the cruise, 3 of which were children under the age of 7 we got to see it through their eyes. We saw 3 types of dolphin: the common dolphin (small); the bottlenose dolphin (larger and as seen at Sea World etc) and in the distance we also saw some Rizzo dolphins but unlike the previous 2 they didn’t want to play with the boat but preferred to keep themselves to themselves. Not that I blamed them. It was amazing to see the difference in size between the common dolphin and the bottlenose. One of them was only about 150lbs and the other was probably up to 10 times that size. Then the rizzo was more white than grey. Apparently the older they get the more white they become. It is definitely something we will do again. You are currently browsing the John and Sigrid's blog blog archives for November, 2010.